Will Social Networking Mediums Replace Government Websites? I remember watching the “Rachel Maddow Show” on MSNBC back in 2011. The news host conducted an interview with Admiral James G. Stavridis, a four-star admiral in the United States Navy. Initially, Maddow commented on the Admiral’s use of Facebook to update the government on the progress in the Libya conflict. Stavridis reported on his Facebook account that NATO was now in charge of all operations in Libya—humanitarian, arms embargo, no-fly zone and protection of civilians. Although the subject matter on the program was clearly on the American involvement in the troubled region, I was interested in the use of a social network medium to report on an active military operation. Admiral Stavridis assumed duties as commander of European Command and as Supreme Allied Commander, Europe in early summer 2009. He is one of the top officials devoted to that region of the world and is required to report on the progress of the mission since NATO assumed all control from the United States. Stavridis created a Facebook account, which is easily accessible by the broader public, and used it to transmit important military data to other units. I understand that this would be dangerous. However, government officials do have Facebook accounts and theoretically could use them to transmit data through social networks. Social networking is a relatively new phenomenon. From Facebook, to Twitter, to MySpace, people are finding new ways to connect with each other. The nanny-state attitude people have toward this medium is the same when email and instant messaging were introduced. As much as individuals harp on the potential dangers of new technology, people still log on and create new accounts every day. I don’t find it odd that governments are using Facebook instead of their own websites to transmit data. The question is: Will governments begin communicating with the public through Facebook instead of their own websites? Will this mean the end of government-run websites altogether? It would be hard to imagine such a possibility based on the actions of Admiral Stavridis alone. I believe that the accessibility of social networks will ultimately lead to the collapse of government-run websites in the near future, but government-run websites will not disappear altogether. Government to Government (G2C): a suite of applications that enable governmental organizations and authorized individuals to conduct business and submit confidential information. In this model, a government agency or institution providing information to another entity of the same type. This causes a reduction in waste and increase better management of internal information. Government to Employee (G2E): activities in which the government institution provides information or services to their employees, thereby increasing their productivity. Government to Business (G2B): a government site that provides information or services to businesses. The indirect income that can result in improved competitiveness lies that companies can get which ends up reflected in an increase in tax revenue. 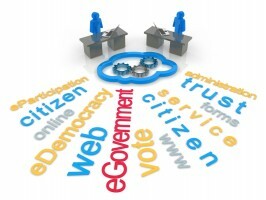 Government to Citizen (G2C): an institutional or government site that provides services directly to citizens. This can result in financial gain resulting from savings in staff and resources and gain indirect result of better information, to become closer to the institutions. The social network is now transforming the way government is interacting with the people. In the past, people would send letters to their representatives asking for assistance in their communities. With more of a presence on social networks, governments would have to keep up with the activities of its citizens, especially when they may be saying negative things. The question is though is it worth sacrificing the rights and freedoms of everyday citizens? One way to answer this is by looking at a program in place in the city of San Francisco. In 2010, the city and the county had created a Facebook page that its citizens access more frequently than its government website. The page posts announcement regarding city activities and gives users a place to comment on different community issues. Chris Vein, Chief Information Officer (CIO) for the city and county of San Francisco, says popular Web 2.0 platforms like Facebook or Google’s search-driven suite of services may be displacing public-sector websites for many citizen-government interactions. According to Vein, on the city’s Facebook page the government has enabled all of the services that are available on our website,” Vein said. For instance, you can pay your parking ticket on the city Facebook site. Vein views this program as just another portal into the city. For San Francisco, this is revolutionary. It is the beginning of a new way for the government to communicate for the public. We’re seeing a fundamental shift in the way services are being delivered,” said Vein, speaking at a two-day forum for government information technology leaders. “We’re looking at perhaps the end of a website for the city and county of San Francisco. I’m being overly dramatic, but websites may no longer be the primary way you get your information.” For instance, Vein pointed to the growing number of Facebook members who use the social media site as their home base on the Web. For certain demographics, Facebook is the only way for entering into a conversation with the rest of the world. They rely on it for their email and other services,” he said. So, will this lead to the end of the e-government in San Francisco or elsewhere? No, but I do believe that the days of governments having their own website are coming to an end. Those users under the age of 30 use Facebook more than the older population. But they are also the same population that uses the Internet more frequently. By the time the younger generation gets older, they will have been used to Facebook technology and government websites will for sure be eliminated. 2 Responses to Will Social Networking Mediums Replace Government Websites? Can you clarify what you are saying here?